Blue Diamond Security is able to offer a Search Equipment Hire service. We have Guard Spirit Portable Search Arches, Garret Search Arches or Knife Arches and Garret Super Wands. Blue Diamond Security have just purchased several highly portable Search Arches for hire, these Search Arches come in 9 pieces and can be set up quickly, easily and are cheaper to hire than the more permanent airport style search arch you may be familiar with. These brand new search arches have been used by the Metropolitan Police and other UK police forces to great effect during operations to deter knife crime in the capital and during sporting and music events. These highly portable search arches are perfect for short-term or long-term hire and are cheaper to hire than the Garrett PD6500i. This easy to use metal detector can find ferrous, non-ferrous and stainless-steel knives and weapons as well as detecting other metals used in bomb-making and acts as an effective deterrent to those looking to cause harm; the search arch is an aid to security and not a replacement for trained security officers. The sensitivity of this highly versatile search arch or knife arch can be changed so that small objects like keys can be ignored and only the larger object found or you can have the sensitivity set to detect a small 2cm metal disk. We can teach untrained security staff search techniques in a very short time so that they can use the search arch effectively and enhance your security plans; we can also provide you with our own search trained security officers. 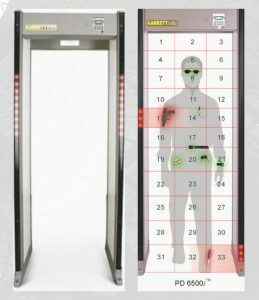 For more extended hire periods or a long-term lease we have the best search arch on the market; the Garrett PD6500i walk-through metal detector or Search Arch is the perfect solution when you need to scan volumes of people quickly and efficiently for concealed weapons, or other metal objects. 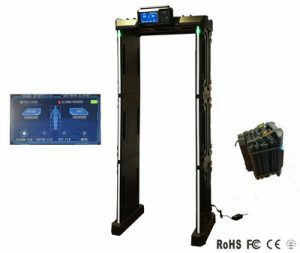 A familiar feature at airports and other sensitive buildings these highly efficient metal detectors are now found at entrances to television studios, sporting events, music events, and other festivals, soccer grounds and nightclubs among other places. 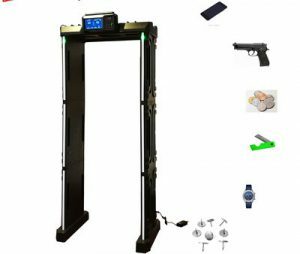 Walk Through Metal Detectors (WTMD) or Search Arch units offer a full head to toe scan area and so can detect metallic objects concealed on any part of the body, from head to toe, on a single pass through. The smart 33 zone detection grid pinpoints precisely where the detected object is on the person passing through the search arch while the indicator lights on the exit side of the archway show you whether the object is on the left, right or central vertical and at what height! The sensitivity of the versatile MD PD6500i search arch can be set to pick up almost any metal object passing through it. It can also be configured to pick up critical metal mass such as guns or knives but to ignore smaller items such as keys, to minimise false alarms in queue situations. For smaller events and venues, we have the Super Wand, not cheap Chinese copies that are not as reliable or as efficient, this easy to use metal detector can find ferrous, non-ferrous and stainless-steel knives and weapons as well as detecting other metals. We can teach untrained security staff search techniques in a very short time so that they can use the Super Wand effectively. The elongated profile provides 8.75" scan area 360° detection coverage plus tip pinpointing for easy scanning from head to foot. Easy and convenient to use with one-touch button and three-colour LED lights. Green LED light indicates ON; Amber LED indicates LOW BATTERY: Red LED indicates ALARM. Rugged injection moulded construction including a structurally isolated coil for added impact absorption. Exceeds Mil-Std-810F (drop test) Method 516.5, procedures II and IV. The Ergonomically designed grip fits comfortably in virtually any size hand. Easy ON/OFF battery cover: standard 9V battery included. Optional rechargeable battery kit is available. For a competitive quote, please get in touch, and I am sure we can help you without breaking the bank! If you would like to find out how we can help you with other security requirements, please visit our services page.